When Caroline Lybbe Powys (1738-1817) visited the Worcester Porcelain Manufactory on 28 August 1771, she was amazed. Viewing the different stages of the ceramic manufacturing process, the moment at which she expressed most wonder was when she saw the potters sat at their wheels creating wares with great speed, ease and accuracy. That Caroline Lybbe Powys looked on at the making of such wares with awe was no surprise. Ralph Thoresby had expressed similar amazement when viewing Nottinghamshire potters at work in 1712. Nevertheless, although seemingly similar, the two experiences were distinctly different. While Thoresby went to watch the potters at work to amuse himself while his coach was repaired, in the second half of the eighteenth century Caroline Lybbe Powys and others like her, toured a range of manufacturing sites around Britain for the particular purpose of learning about and comparing production processes. Industrial tourism grew and prospered in the second half of the eighteenth century and increasing numbers of middling, genteel and elite visitors took themselves off to locations around Britain to witness first hand Britain’s growing industrial endeavours. No longer engaged with forms of production themselves, these individuals were keen to learn about the skills and materials involved in the making of the objects they purchased in ever-greater quantities from shops and markets. Yet, industrial tourism was just one of a range of means of acquiring a greater knowledge of the making of the material world in eighteenth-century England. 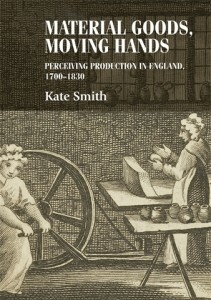 My book Material Goods, Moving Hands: Perceiving Production in England, 1700-1830 demonstrates that eighteenth-century consumers understood the objects they purchased as material things and sought out different ways to learn about how their evermore sophisticated material world came to be made. Ceramics became increasingly important to eighteenth-century British society. Often global goods imported from China, or transported from European or British manufactories keen to imitate and innovate in new ways during the period, ceramic wares delighted customers. They became increasingly delicate and intricate during the period, allowing customers to engage in new social practices such as tea or chocolate drinking. As homes became sites of hospitality, ceramic wares acted as key demonstrators of a family’s taste, status and discernment. Rather than blindly following elite fashions, customers had to navigate their ways through an ever-fuller market place keen to provide choice for every social group. Wares had to be chosen that were appropriate and neat rather than showy. Ceramics inhabited a place at the heart of Georgian life as vehicles of sociability and politeness. At the same time choosing a piece that contained no flaws was not always easy and customers needed to also master a certain level of material discernment. People needed to be materially literate and fashion savvy to navigate the market place successfully. Material Goods, Moving Hands: Perceiving Production in England, 1700-1830 focuses on these new and important consumer goods, but specifically explores how people understood their making. It looks to encyclopedia articles, industrial tours, retailers’ advertisements, shop displays and trade cards and finally to manufacturers’ pamphlets to decipher the many ways in which writers, retailers and manufacturers represented the production of these wares to consumers and how consumers responded to the depictions they engaged with. It also looks closely at the ways in which manufacturers and workers represented the manufacturing of ceramic wares to themselves. Often acting as both consumers and producers, how did potters understand the material world and the changing ways in which they made it? In exploring these questions and others, the title shows the connections that existed between production and consumption in the eighteenth century. Rather than distant lands, it shows how consumers found new ways in which to develop and navigate links to production. Similarly, manufacturers and retailers facilitated connections between the two and although increasingly keen to present production as something distant and difficult for consumers to understand, the objects they manufactured and sold continued to prompt questions of production and ensured that consumers remained interested in the material nature of the goods they consumed. 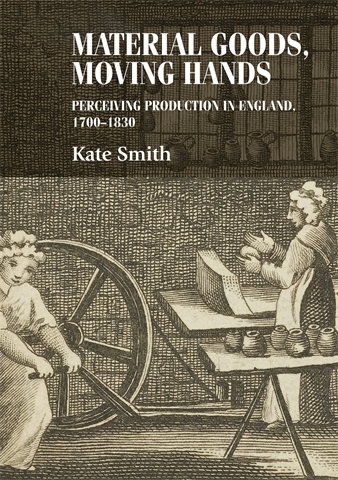 Kate Smith is Lecturer in Eighteenth-Century History at the University of Birmingham and author of Material Goods, Moving Hands: Perceiving Production in England, 1700-1830 (Manchester: Manchester University Press, 2014). Category: Art History, Cultural Studies, History	0 Comments.